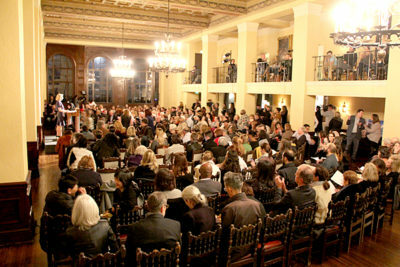 A sold-out crowd gathered at The Ebell of Los Angeles to hear knowledgeable neighbors talk about solutions to a very visible problem, the vagrant and homeless people on the streets in all neighborhoods of Los Angeles, including those of our Mid-Wilshire communities. The Ebell gathering was the first in a series of outreach events being organized by local residents Marilyn Wells of Hancock Park and Allison Schallert of Larchmont Village. 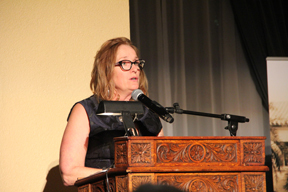 At The Ebell, Wells introduced several speakers, including Windsor Square resident and First Lady of Los Angeles Amy Elaine Wakeland, Fourth District Councilman David E. Ryu and United Way director of public affairs (who grew up in Windsor Square) Tommy Newman. The title of the program was “Stories from the Frontline: Ending Homelessness through Supportive Housing.” Speakers, both formerly homeless and their advocates, shared their experiences dealing with the issue. In the adjoining art gallery, advocacy groups Corporation for Supportive Housing (CSH) Speak Up!, Imagine LA, Aviva Family and Children’s Services, United Way, League of Women Voters, and Safe Parking LA described their programs and enlisted volunteers. 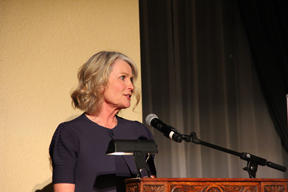 By the end of the evening, Ebell members and others in attendance appeared to be mirroring the optimistic, positive and take-charge spirit of Wells and Schallert. Another such event — to educate neighbors and galvanize communities to welcome supportive housing for the homeless — will be held on June 5, 2018 at the CSH Supportive Housing Summit in Downtown Los Angeles. More details will be announced at: StoriesFrontline.org.